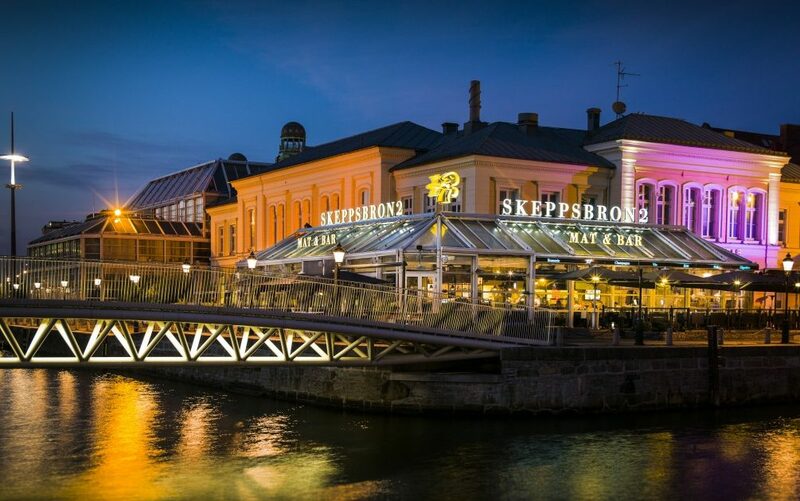 Skeppsbron 2 is a restaurant located in the Malmö Stock Exchange next to Malmö Central Station, with space for 180 guests and a large glass-enclosed veranda with views over the canal. 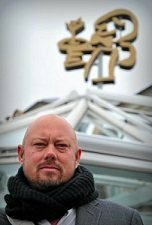 Restaurateur Andreas Pieplow has owned the restaurant since 1995 and runs it as a brasserie, with the ambition to create a friendly meeting place in a relaxed atmosphere and with good food inspired by the world’s metropolises. 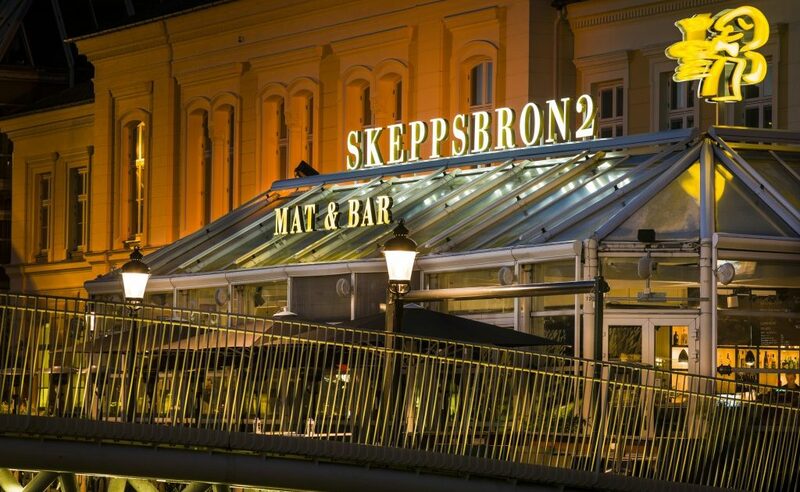 In 2015 Focus was tasked with providing Skeppsbron 2 with new restaurant signs and to make signage clearer in the centre of Malmö. 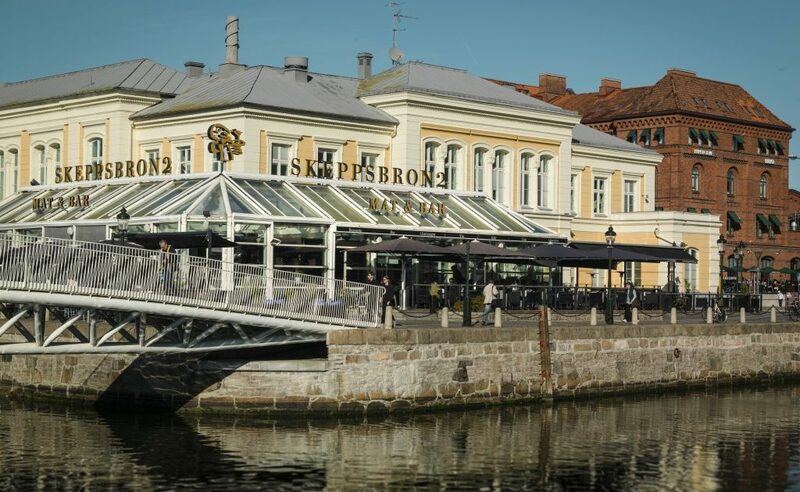 The restaurant is located in central Malmö, but the site is still separated from the rest of the inner city, as the canal acts as a separator and the majority of passers-by keep to the other side of the canal. There is a lot of competition from districts such as Lilla Torg and Möllevångstorget, where more restaurants can be found, and the number of spontaneous visitors to restaurants is considerably smaller in comparison. 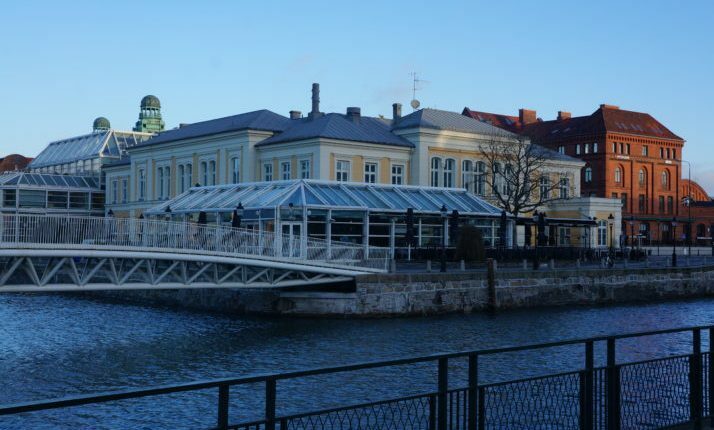 The restaurant also has a large glass-enclosed veranda, and limited scope for signage as the Malmö Stock Exchange is considered to be a building of historical significance. Below are pictures of the Skeppsbron 2 restaurant without signs. Focus was chosen as the supplier, as Andreas Pieplow was looking for a supplier that could appreciate and understand the restaurant’s challenges, come up with well thought-through ideas and deliver the highest quality signs. Focus became quickly involved in the design process and developed different design solutions in consultation with restaurateurs and property owners. After consultation with the municipality, some final adjustments were made and in the end all parties agreed on free-standing letters mounted on the glass veranda’s roof, completed with a rotating stylised waiter in yellow. All signs are fitted with LED lighting and the letters have a black and white effect, which means that they are black during the day and light up in white during the hours of darkness. ‘Food & Bar’ is lit up in a yellow light. We have seen an increase of 30% since the new signs went up. Since the new signs were put up, Andreas has seen a marked difference. The restaurant’s location has been made visible in a whole new way, in the day-time as well as the evening, and the increase in drop-in guests is significant. There are, of course, many other activities going on at the restaurant at the same time to attract guests, but Andreas states that the increase is up to 30% compared with previous figures. Now our restaurant signs have also been nominated for the prize of Sign of the Year in Malmö 2015. The winners will be announced on 15 September 2016. It would clearly be a huge success to take the prize home,’ says Andreas Pieplow. Download and read the full case study in PDF format.